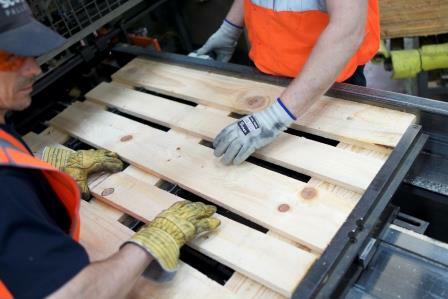 UK and European timber pallet manufacturers are experiencing unprecedented challenges in relation to sustained rising costs and, increasingly, pressure on timber supply and availability. The prevailing market conditions that were already apparent through late 2016 and all of 2017 have continued into this year and are set to persist. The term “perfect storm” is being widely used across the market to describe the escalating and unprecedented price increases together with supply shortages. The UK’s dependency on timber imports to meet domestic demand exposes the UK timber buyer to global market influences, impacting both price and availability. For the first time in many years all global timber markets are busy with demand outstripping supply across all sectors simultaneously (sawn, pulp, chip, composite, construction, joinery, and biomass). These buoyant alternative markets combined with unfavourable exchange rates are fuelling a growing scarcity of imported timber. UK timber buyers are faced with limited competitive alternatives (German, Canadian, Chilean at 20-25% higher prices and limited availability). Whilst the UK is still an important market for Latvian pallet timber, supply is increasingly being seen as less attractive and suppliers have been motivated to seek out alternative markets including the Middle East, North Africa, China and Korea where significantly higher prices are being achieved. The economic recovery has gained pace in Western Europe and global trade is picking up which is generally leading to a growing demand for sawn timber. Despite a slowdown in the Chinese economy, this region’s high timber deficit continues to stimulate growth in timber imports across all grades including smaller logs which would normally supply into the pallet and packaging timber market. In Europe, the main market for wood is construction. The 200,000 new homes being built each year in the UK are increasingly being constructed using timber-frame techniques. Long-term, government-backed, domestic housebuilding commitments are helping to drive sustained growth with a resultant increase in timber demand and price. A similar picture in France has seen a 15.7% increase in new housing, placing additional demand on timber supply. FNB (Federation National Du Bois) Feb. 2018. Pallet timber prices have risen for the 19th consecutive month (Markit/CIPS UK Manufacturing PMI, Feb 2018) and the UK Poyry timber index reports a near 35% cumulative increase on some grades since Q1 2016. The German HPE (http://hpe.tops.net/daten-und-fakten/holzpreisindex/hpe-price-index/) and French CEEB indices reflect a similar trend. With timber representing the most significant element of total cost, new timber pallet sales prices are inevitably rising across Europe. Reconditioned pallet prices are also rising and availability is under pressure as demand grows in reaction to rising new pallet prices. In an industry where margins are already weak, and the raw material cost is around 70% of the pallet price, any failure to pass on increased costs to customers could signal problems. This sustained pressure is likely to inhibit many businesses from future investment aimed at productivity improvement which could potentiate problems already being experienced in relation to labour shortages. The impact of global market demand has also been exacerbated by a range of other significant factors including seasonal weather conditions which have negatively affected logging and logistic conditions. In the Baltics and Nordics, earlier in the year, it was too wet, forcing the Latvian government to formally declare a disaster in the forest sector due to flooding. This enabled producers in Latvia to trigger the Force Majeure provisions in their supply contracts. These conditions have, however, more recently, been superseded by temperatures of -20 degrees centigrade which has prevented safe access to the frozen forests and made sawmilling almost impossible. Log inventories at the mills are consequently very low and shipments are also being delayed by a lack of availability of sea freight vessels. The formation of ice in the bay has the effect of limiting the type of vessel that can provide safe access and there are already reports of some shippers imposing ice surcharges. Competition for available logs is a mounting concern and is creating additional pressure on pallet timber availability. As biomass demand grows, fuelled by favourable government subsidies and investments, increasing volumes of saw logs (small diameter logs traditionally used in pallet timber production), are being diverted to this emerging industry. The potential impact of this is already in evidence at larger UK mills where production is being limited rather than pay higher prices. Availability of pallet timber is consequently likely to be the most significant feature of 2018. There are no new or alternative markets for buyers to turn to, mills are declining to take on new customers and refusing to commit forward on price or volume. The strength of existing relationships in the timber supply chain is therefore likely to be key to securing volume supply and buyers are being forced to re-evaluate the value proposition that their pallet supplier offers. Despite rising costs, timber pallets remain the most economical and sustainable first choice for buyers. Increasingly buyers are looking to work more collaboratively with their pallet suppliers, to tailor a solution to meet their business’ needs. This could include redesigning pallets to reduce overall timber content while maintaining operational performance and safety criteria, sharing distribution data to support pallet recovery, repair, and reuse, switching from new pallets to reconditioned pallets, working smarter to reduce logistic costs by establishing onsite operations or making joint back haul arrangements. Buyers committed to sustainable procurement and collaborative practices will increasingly recognise the value of a pallet supply partner able to manage the complexity of the timber market; offering supply security and innovative solutions to help manage rising costs. Adopting a willingness to be flexible with regard to the specification will facilitate an experienced pallet manufacturer to offer substitutions to manage material constraint challenges. Support from experienced Account Managers with access to credible technical support will ensure reliable and practical alternatives are offered that add significant value.